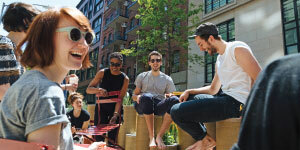 Located in Greenwich Village in the heart of New York City, The New School is the only comprehensive university housing a world-famous design school, premier liberal arts college, renowned performing arts college, legendary social research school, and an array of other schools and programs designed for students at every age and stage of life. One of the best things about being a student at The New School is getting to experience New York City, one of the greatest cities in the world. Located in New York’s historic Greenwich Village, The New School is connected to all that New York has to offer: its culture, its international perspectives, its opportunities, and its energy. Type of SCHOOL: The New School is a private nonprofit university. Size of campus: Integrated into the vitality of New York City, The New School’s urban campus features more than one million square feet of facilities in Greenwich Village (downtown Manhattan). Colleges, programs, and degrees: The New School offers more than 135 undergraduate and graduate degrees. Geographic diversity: Undergraduate and graduate students come from all 50 states, plus the District of Columbia and 118 countries. International student services: International Student and Scholar Services provides support and comprehensive advising. International student budget: (2018–2019) Tuition varies by program. Average yearly expenses—including tuition, fees, health insurance, and room and board—are $70,485. For details, visit newschool.edu/registrar/tuition-and-fees. Financial aid: International students are automatically considered for merit-based scholarships. Need-based awards are not available. Test score requirements: Applicants who are not native English speakers are required to submit TOEFL (Test of English as a Foreign Language) or IELTS (International English Language Testing System) results. Scores of 92 on TOEFL (internet based) or 7.0 on IELTS are preferred. Application deadlines and fees: The fee to apply is $50. The Early Action application deadline for Parsons and Lang, and the Regular Decision deadline for Mannes, is November 1. The Regular Decision deadline for all other undergraduate programs is January 15. Imagine a university where scholars, artists, and designers find the support they need to challenge convention and fearlessly create positive change in the world. Imagine a community where walls between disciplines are dissolved—where journalists collaborate with designers, architects with social researchers, media specialists with activists, poets with musicians. Imagine an intellectual and creative haven that never has and never will settle for the status quo. The New School is just such a university community, attracting students from all over the world to its home in the heart of Greenwich Village. Founded in 1919 by those who imagined a school that would rethink the purpose of higher education, The New School now offers more than 10,000 students programs of studyacross more than 135 undergraduate and graduate degrees. No matter what area of study students pursue, they discover a unique form of creative problem-solving that will forever change the way they investigate and create—relentlessly questioning convention, collaborating acrossdisciplines, and taking risks. For undergraduates, The New School offers programs in art and design, liberal arts, and the performing arts at Parsons School of Design, Eugene Lang College of Liberal Arts, and the College of Performing Arts, comprised of Mannes School of Music, the School of Jazz and Contemporary Music, andthe School of Drama. Additionally, The New School offers the Bachelor’s Program for Adults and Transfer Students. For more information, visit newschool.edu/public-engagement/bachelors-program. Parsons School of Design has offered students innovative approaches to education since its founding in 1896.Today it offers undergraduate degreeprograms in New York City and Paris,immersing students in focused training, interdisciplinary inquiry, andpractice-based collaborative learning. At Parsons, creators and scholars master established art and design fieldsand advance emerging ones while studying a range of University disciplines. Guided by renowned facultyand curricula, a diverse international community disrupts the status quo,fostering social and environmental good and preparing students for an evolving workplace. New York City is home to Parsons’smain campus and a range of creativepractitioners and industries. ParsonsParis offers students an atelier-like setting from which to explore heritagebrands and traditions, new technologies, and a host of art, design, andbusiness partners in Europe and beyond. Together, these complementarylearning communities make Parsonsa singular launchpad for a creative education and career. At Parsons, the diverse communityof students develops critical-thinkingskills and applies them to challenges ranging from environmental degradation to physical accessibility and humanitarian crises. 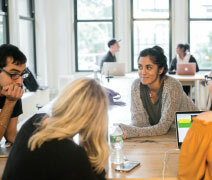 Through a networkof interconnected design laboratories,students explore global phenomenaat multiple sites and scales of engagement, from on-campus research initiatives to partnerships that effectchange in New York and around theworld. Professional internships withthe world’s top designers and artists, interdisciplinary collaborations, andinternational study opportunities augment Parsons’s undergraduate programs in Architectural Design; Art, Media, and Technology (Parsons Parisonly); Communication Design; Design and Technology; Fashion Design;Fine Arts; Illustration; Integrated Design; Interior Design; Photography; Product Design; and Strategic Designand Management. Students can earna joint BA/BFA degree with Eugene Lang College of Liberal Arts. Eugene Lang College of Liberal Arts offers students a major advantage: the ability to explore liberal arts within acomprehensive university housed in New York City. The city’s vast intellectual resources are fully integrated intothe curriculum, ensuring a uniquelearning experience built around socially relevant questions, seminars co-taught by community partners,in-depth internships, and service learning programs. Life in the cityfeeds a limitless range of interests,and Lang provides numerous ways tostudy liberal arts in conjunction with the city’s art, culture, music, and political events. Students can choosefrom more than 50 University-wideminors, pursuing connections between humanities, fine arts, and social and natural sciences. Described by The Princeton Reviewas the best college in the country for encouraging debate and discussion, Lang has a rigorous program of study based on a seminar approach to teaching and learning. Students from across the country and around the worldcome to Lang to study with a world-class faculty, intern at prestigious organizations, and immerse themselves in the world of Greenwich Village and New York City. Lang offers Bachelor of Arts degrees in Anthropology; the Arts (concentrations in Arts inContext, Dance, and Visual Studies); Contemporary Music; Economics; Environmental Studies; Global Studies;History; Interdisciplinary Science; Journalism + Design; Liberal Arts; Literary Studies; Philosophy; Politics;Psychology; Screen Studies; Sociology; Theater; and Urban Studies. Lang also offers dual BA/BFA degrees with Parsons and the School of Jazz and Contemporary Music and enables students to accelerate theirprogress toward a master’s degree by combining their undergraduate workwith graduate study at one of The New School’s graduate schools. Dual BA/MA degree programs offered atLang include Anthropology, Economics, International Affairs, Liberal Studies, Media Studies, Nonprofit Management, OrganizationalChange Management, Philosophy,Political Science, Psychology, Sociology, and Urban Policy Analysis and Management. Founded in 1916, Mannes School of Music seeks to develop citizen artists who engage with the world around them through music in traditional, new, and emergent forms of practice. Our eminent faculty of artists, scholars, and educators of international stature—including active professionals from all areas of the music world—foster close, constructive relationships with students and are committed to advancing the creative role of music throughout all aspects of our rapidly changing society. Mannes is a community of compassionate musicians who encourage collaboration rather than competition and professional development rather than personal pressure. Mannes is small and selective, limiting degree enrollment to approximately 330 students—making it the smallest in New York City. The Mannes faculty include manycelebrated concert artists, chamber musicians, and composers. The comprehensive Techniques of Music curriculum sets Mannes apart, providing a broad foundation including eartraining, advanced music theory, and dictation. Mannes offers Bachelor of Music degrees in Classical Guitar, Composition, Harpsichord, Orchestral Conducting, Orchestral Instruments, Piano, Theory, and Voice. The School of Jazz and Contemporary Music was founded on the principlethat working artists should play a role in jazz education. One of the most influential institutions of its kind, the School offers a progressive curriculum, small ensemble-based performance, a stellar faculty composed of artist-practitioners, and access to unique musical opportunities throughout New York City. The faculty are comprised of legendary musicians, mentoring students to develop the confidence and knowledge to experiment, take risks, and find their own authentic style of self-expression. New York also provides the benefit of the best live music venues in the world, giving students endless opportunities for performance and exploration. The School of Jazz and Contemporary Music offers the Bachelor of Fine Arts degree in Jazz and Contemporary Music, with concentrations in Composition, Instrumentals, Liberal Studies, and Voice. Students can earn a joint BA/BFA degree with Eugene Lang College of Liberal Arts. The four-year BFA program in Dramatic Arts at the School of Drama prepares students to be 21st-century artists and creative thinkers. Through studio classes, performance opportunities, and course work in aesthetic inquiry, the history of theater, and collaborative research, students cultivate the intellectual, conceptual, and critical skills needed to launch careers in theater or any field thatrequires creativity, collaboration, critical thinking, and effective communication. The program’s interdisciplinary, project-based curriculum enables students to explore acting, directing, playwriting, creative technologies, liberal arts, applied research,and collaborative processes, guided by a faculty of working professionals from New York City’s theater community. The New School’s BA/BFA pathwayis designed for students who wanta comprehensive education in liberal arts and music or the arts. Students earn a liberal arts BA from Eugene Lang College and a BFA fromeither Parsons School of Design or the School of Jazz and Contemporary Music. Most students drawn to the BA/BFA pathway are active in the arts and excel academically in high school. As college approaches,they face a choice: focus on their art or get a liberal arts education. Instead of picking one, BA/BFA students at The New School pursue both. The New School’s New York City location offers access to hundreds of cultural opportunities, including museums, concerts, theaters, restaurants,parks, and the streets themselves. TheNew School believes that students learn both in and out of the classroom. With access to a wide array ofinternships, apprenticeships with topdesigners, and performance opportunities in venues from downtownclubs to Lincoln Center, students canshape their education and take advantage of all the University and thecity have to offer. Current and pastinternships include Marc Jacobs, TheColbert Report, HBO, MTV, The New York Times, The New Yorker, Rolling Stone, Marvel Comics, and the Museum of Modern Art. Student organizations contribute greatly to the campus community and life at The New School. Student groups cover a wide array of interests: pre-professional and academic; political action and advocacy; international interest; art, music, and performance; social and special interest; and faith based, religious, and spiritual interest. We encourage students to get involved in registered student organizations or create new organizations that serve previously unmet student interests. It’s a rewarding experience that helps you grow—socially and in areas of leadership—while establishing lifelong friendships. The cost of attending The New School varies from program to program andsometimes from student to student. Many of the students attending a degree program at The New School take advantage of financial aid. US citizens or eligible non-citizens must complete the Free Application for Federal Student Aid (FAFSA), and undergraduate degree-seeking internationalstudents interested in grants or scholarships from The New School should complete the Undergraduate International Student Scholarship Application. For forms and more information, please visit newschool.edu/admission/financial-aid/how-to-apply. For a list of graduate program offerings at the University, visit newschool.edu/academics/graduate. Parsons’s academic center in Paris offers undergraduate degree programs taught in English. Guided by a faculty of professionals from Europe and New York, students at Parsons Parisuse the city as a laboratory, collaborating on creative projects and exploring ways to apply art and designto the challenges of urban life. Formore information about Parsons Paris,visit newschool.edu/parsons-paris. The New School was founded in NewYork City nearly a century ago by asmall group of prominent Americanintellectuals and educators. Frustrated by the intellectual timidity of traditional colleges, they envisioned a new kind of academic institution wherefaculty and students would be free to address the problems facing societies honestly and directly. In 1919, they created a school of advanced adulteducation to bring creative scholars together with citizens interested in improving their understanding of the key issues of the day through active questioning, debate, and discussion. The New School has evolved continuously throughout the years in response to changes in the marketplace of ideas, career opportunities, and human curiosity.